SIGN IMAGE have extended the horizon of sign possibilities into a exciting new territory. Electronics has grown and evolved over the past 30 years, but the benefits remain the same. The attention an electronic display attracts creates top-of-the-mind awareness in potential customers. SIGN IMAGE is the #1 installer of Watchfire Electronic Message Center in the Midwest, and #2 in the United States. Watchfire backs all our installations with a 5 year Parts Warranty assuring you peace of mind for years to come. 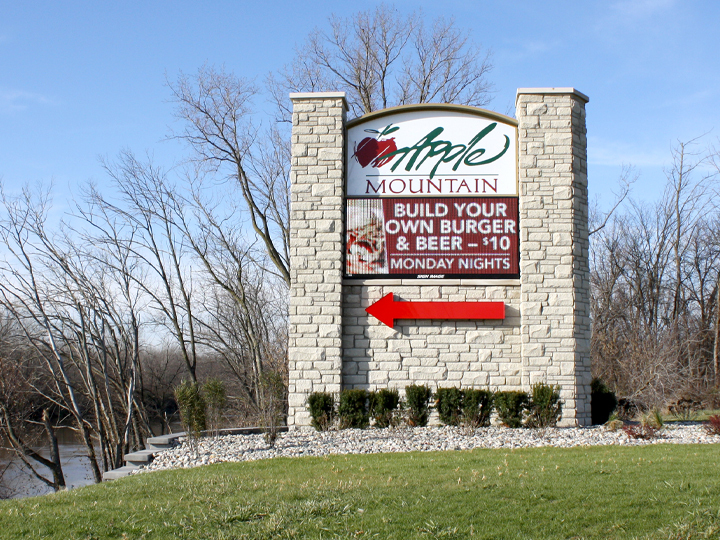 Our creative department will create a sign exterior structure that will compliment your branding and building and will make the electronic message center stand out from the rest of the signs on your road. Our service department can keep your display working and looking as good as the first day it was installed. Because all our LEDs and signs are custom designed and built for clients’ specific requirements, prices are established for each project to ensure optimal cost benefits. Make a bright and colorful impression with electric & LED signs for your business. Put your message in the best light with back lit displays that that make your advertising and informational messages readable in any setting and any lighting. Get colorful static or scrolling LED signs for high-impact communication. Whether indoors or out, you can control LED sign boards from a centralized location. From sign cabinets and channel letters to custom back lit signage and digital LED displays, we have everything you need to increase your visibility and attract customers, day or night.